Jake's Famous Really Good Mild Old School BBQ Sauce for sale is the result of 15 years of solid hard work and contribution toward building a BBQ Sauce that rivals all comers. In the early 2000s we created our first BBQ Sauce with a focus toward rich flavor, with a slight spiciness and beat the band taste. Voted Best BBQ Sauce this sauce was quickly rewarded for its uniqueness and acceptability by hundreds of customers in the early days of the internet. As time moved on and markets changed and masses of competitors entered the market we knew we needed to up our game to deliver on our long standing best bbq sauce quality. We developed complex formulas and non standard ingredients like berries but in the end we knew we had to focus on what made us great. And that greatness came from our focus on All Natural, Gluten Free ingredients that didn't taste like they were all natural or gluten free. Our BBQ Sauce for Sale was built to match the taste buds of some pretty demanding customers those that had come to love our sauces but sensed as we did that the market was changing. How did we keep up with the changes, we stepped back and asked those very same customers what they expected from our best sauce. The message loud and clear was an Old School formula that was designed to be used on brisket, pulled pork bbq, bbq chicken, bbq ribs, bbq spare ribs, fish, steaks and Tri Tip and any other form of meat they could throw at it. To get this formula we knew we needed to expand our horizons and to reach out to our network of professionals. So, on the road we went traveling to Texas, Arkansas, Florida, Georgia, Tennessee and Kansas. We knew we were onto something when we landed in Kansas. There we met up with some pretty famous chefs and pitmasters who shall remain nameless only because we said we would not disclose their secrets. So, with insight from these chefs and pitmasters we began rebuilding our Best BBQ Sauce formula. Now after months of trial and error we have our revised sauce formula which we call Jake's BBQ Sauce. The name comes from the response received by so many customers. They named the product so it stuck and now we offer this Really Good Mild Best BBQ Sauce to our customers across the US and Canada. We gathered a listing outlining why we like this Really Good Mild Best BBQ Sauce. 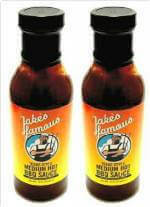 Jake's BBQ Sauce Really Good Mild Best bbq sauce is made from a 10 ingredient formula just like old school recipes. The sauce is slightly sweet and tart with noticeable levels of vinegar and molasses. There is pepper in the sauce complimented with garlic and onion and more. When you pair the sauce with brisket, baby back ribs, spare ribs, or chicken you get hints of the Old School formula you may remember when you were a kid somewhere in the South Eastern part of the United States. While in Texas and Kansas taking the sights and feasting on loads of baby back rib creations by some very well know experts we paid special attention to the thinness of the best bbq sauce. While roaming the locations I was able to spend time talking with the Pitmasters sharing how we in California focus our sauces with tomato bases and complex versions of molasses, garlic and onion. I asked if they'd review our products and talk about their way of barbecue. From that our friendship was formed and we decided to collaborate on the development of our sauce. These chefs and Pitmasters were more than kind and we've sent them scores of products hoping to get honest feedback. One day out of the blue we received a phone call from a well know Pitmaster who said in no uncertain terms...if you've found the bottom of the hole...stop digging. What he meant was we had finally achieved the success we were seeking we had achieved our best bbq sauce. This was the point that they considered our products good enough to compete directly with Texas and Kansas style sauce. We were pleased to say the least. We said it before we are blessed to have some pretty great palates which has led to the development of 35 or 40 different products all centered on the barbecue market. Our ongoing hope is that we have the ability to travel and give back to those chefs and Pitmasters who befriended us and gave us so much of their time. For now we'll give back to our deserving customers with our best bbq sauces and dry rubs. So let's focus on the Really Good Mild Best BBQ Sauce. We've used the sauce in our Lee's Lazy Man bbq creations named after a gentleman who was so lazy to cook we thought he'd never eat. But of course when it came to ribs he stepped it up and got the job done. Our best pairings for this best bbq sauce are of course ribs, barbecue spare ribs, and chicken but the sauce is excellent with fish and turkey. I like using it to make turkey wraps with cheese and bacon. Speaking of turkey this sauce pairs excellently with turkey wings and just plain old turkey breast. Consider using our Really Good Mild best bbq sauce when the holidays roll around. In addition to ribs and other meats this is a really fantastic brisket sauce. Because this sauce contains an old school formulation with nice hints of vinegar it makes it especially bold and flavorful as a brisket sauce. After your long 12 or 14 hour brisket roasting this brisket sauce is warmed and added along side your special recipe brisket. Notice how the notes of molasses, honey, vinegar and smoked salts even coats the meat adding a whole new dimension of flavor. This is a perfect offering for those who enjoy brisket. For those of you considering ribs and who just don't have access to a grill no worries. This Really Good Mild BBQ Sauce is absolute perfection on ribs in the oven. Ribs will come out nice and moist with just the right amount of caramelizing. The steps are simple and included here. Just select your baby back ribs or spare ribs along with Jake's BBQ Sauce Mild Best BBQ Sauce and Jake's Tri Tip, Steak and Rib Rub or other Jake's Famous Dry Rub. To achieve maximum flavor it's a good idea to properly address your ribs. Meaning the best ribs have the silver membrane removed from the curved side of the rib bones. The best way to do this is after the ribs have been properly cleaned and patted dry take a paper towel and grasp an edge of the silver membrane starting at the top of the ribs. By grasping an edge and pulling toward the other end of the meat you'll start to see the membrane separate from the meat. The first few times you pull on the membrane it might appear slippery and may fold back, no matter keep pulling with increased force and the membrane will come off easily. Some say that it's best to remove the membrane while it's cold I like doing it just after cleaning as the membrane is more pliable. Once the membrane is removed rub the ribs generously with the dry rub and wrap with foil. Let the ribs rest in the foil for about an hour. Set your oven to 350 degrees. While the oven is reaching temperature set the ribs on the counter so that they come to room temperature. Place the ribs in foil in a metal baking pan. Cook for about two hours and remove from the oven. Open just the top of the foil and lather on Jake's Famous Really Good Mild Best BBQ Sauce covering both sides. After the sauce is applied leave the ribs on the meat side up with the foil open. Turn the oven to 400 degrees and cook for approximately 15 to 20 minutes at 400 degrees. The additional heat will create a caramelizing effect on the top of the ribs. Once done remove the ribs and cover allowing the ribs to rest for about 20 to 30 minutes. Keep some extra Jake's BBQ Sauce on the side in a warm dish then serve and enjoy. Additional pairings of coleslaw, corn on the cob and baked potatoes will really make this meal stand up. We will note that we put together a video on Snake Method BBQ Ribs using our dry rubs and best bbq sauce on a Weber BBQ grill which is online now. We think this Really Good Mild Best BBQ Sauce would be a great pairing for ribs, spare ribs, chicken and fish. We expect in the coming weeks to add new videos focused on the use of our Best BBQ Sauces and dry rubs. This Really Good Mild Best BBQ Sauce just keeps on giving with flavor and taste. Finally imagine a lazy afternoon, the sun on your back, a light breeze blowing across, you've got tongs in hand standing next to a red oak firewood BBQ with your favorite adult beverage while your yard is permeated with the aromas and smells of Jake's Famous all natural bbq sauce is marinated on prime cuts of meat, fish or vegetables. If this isn't you it easily could be when you order Jake's BBQ Sauces, Dry Rubs and Condiments. Kendra K. wrote: Overall: "This is an exceptional product that every kitchen should have at least one of the Original/Mild BBQ Sauces. With the holidays coming up soon, this would be a great stocking stuffer! This sauce is great! Now since I live in Texas I typically like some spicy BBQ sauce, but this mild sauce is perfect for the whole family! It is a sweet sauce, but is all natural, meaning no corn syrup, no preservatives, Gluten Free, MSG Free, and 0% Trans Fat. Hubby and I used our sauce on BBQ chicken, smokey links, and even on meatloaf for a zesty alternative to ketchup or tomato sauce! It is a mild sauce, but it has a nice, sweet, garlic flavor. I don't normally like sweet sauce because it is too sweet, but Jake's Original Mild BBQ is the perfect amount of spice and sweetness! It is such a versatile sauce I will be having to order some more soon! Taz Seally wrote: "Rich flavored BBQ Sauce, no corn syrup, spreads nicely and doesn't burn off, penetrates the meat nicely, acts as a great marinade and is sold at a great price. This is all you need to know about the greatness of this sauce. Give this sauce special consideration and pick it up now, you won't go wrong". Recommended Uses: Homemade Pulled Pork Barbecue Sauce recipes, BBQ Sauce and dry rub rib recipes, Honey Glazed Hot Wings Barbecue, homemade barbecue sauce recipes, pulled pork and beef ribs. 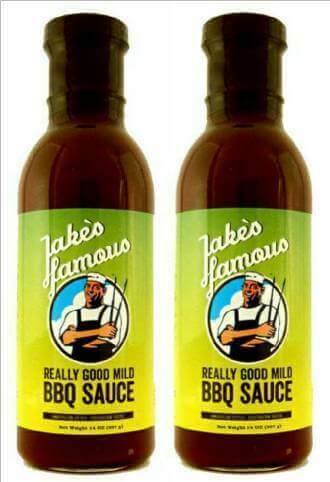 Winner of the coveted International Taste and Quality Gold Medal making Jake's Famous Really Good Original Mild Barbecue Sauce a proven winner. Buy Jake's BBQ Sauce by Clicking Add To Cart and ordering Today!